Americans love their poultry -- They consume more than 8 billion chickens every year. And, this Thanksgiving, according to a National Turkey Federation survey, they will gobble down about 45 million roasted turkeys. 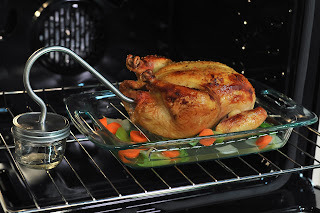 A conventional oven cooks turkey from the outside, which tends to dry out the meat. Enter the TurboRoaster, with its vapor-infusion system, which cooks poultry from the inside, guaranteeing juicy and tender meat. The TurboRoaster takes the guesswork out of cooking and produces a perfect 6-pound chicken in just 45 minutes, or a 25-pound turkey in just 2 hours and 15 minutes, every time. Just add water to the glass container, insert the attached tube into the chicken or turkey, and roast. The patented vapor-infusion system does all the work in half the time, giving you more time to spend with your family this holiday season. TurboRoaster is available in stores nationwide, including Bed Bath and Beyond, Walmart, Target, CVS Pharmacy, and retails for just $19.99. I tried to order two of these from the turbo roaster website. Instead of getting what I wanted, the site added on two additional knives that I could not cancel. I tried to call them. No answer, could only place another order. I emailed them but no response yet. Why do companies upsell you and make you mad in the process. I will cancel this order or dispute the charge with my credit card company. I will not reorder! Jenny Craig: Does it Work?